Sixteen-year-old Claire wants her father back. His death left her only memories and an empty locket. After six difficult years in foster care, her vocabulary no longer includes "hope" and "trust." But everything changes dramatically when she encounters Justin, a Spirit Knight restlessly hunting dangerous ghosts that devour the living, who rides into her path on his magical horse and takes her under his wing. When an evil spirit threatens Claire's life, she'll need Justin's help to survive. No one, including Claire, believes she can be a Spirit Knight, even when all signs show she is ready to become one. This is because the Spirit Knights have been a boys' club for over a thousand years. Worse yet, Claire will have to dive into the hair-raising ghost-hunting job before she gets full access to the Knights' order. Fortunately for her, she has Justin as her private tutor. With the help of his sarcastic horse and saintly wife, he'll teach her the finer points of the job. Add in a little luck, and they both might survive long enough for her to learn it all. 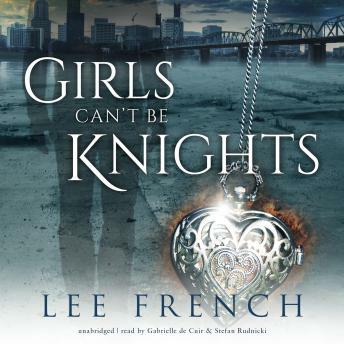 Girls Can't Be Knights is a magical and unique adventure story that will touch your soul and raise your spirits.